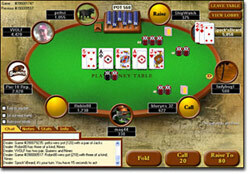 Poker Stars is a fantastic online poker site offering a multitude of games, bonuses, options and opponents. It has risen in popularity due to its many tournaments and the fact that it is home to some of the biggest names in the industry (WSOP winners Chris Moneymaker (2003), Greg Raymer (2004) and Joseph Hachem (2005). 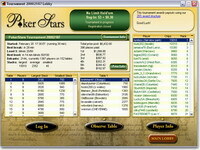 Poker Stars is one of the market leaders (2nd largest) in the online poker world. It has a multitude of online tournaments and is a sure bet when looking for an online poker experience. Poker Stars hosts many satellites and major land-based tournaments. They are the leaders in sending numerous players to WSOP and WPT tournaments as well as many European Poker Tour events. 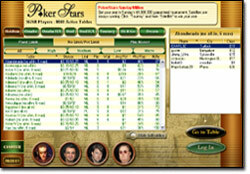 Software: Poker Stars uses excellent software with many options (change table sizes, different themes, image uploading, poker hand history... just to name a few). The graphics, layout and sound are all excellent. The interface is totally customizable. Game Selection: PokerStars has a great variety of games (Texas Holdem, Omaha Poker, Omaha High-Low, Seven Card Stud, Seven Card Stud High-Low, Razz, HORSE and Poker Tournaments) with numerous room limits and minimum table-buy-ins. Player Traffic: With such a large player base (~100,000 tournament players and 12,000 ring players at any one time), both the novice and the advanced players can benefit from Poker Stars since there are so many players online at all times. Competition: The competition ranges from novice players that can easily be beaten to the world’s best players at the higher stakes tables. Loyalty Program: FPP’s (Frequent Player Points) are earned for both cash and tournament game play and can be redeemed for a wide variety of purchases, from tournament entries, to clothing, to exclusive items you'll find only in the PokerStars FPP Store. Poker Stars offers a special VIP Program which includes numerous bonuses. These include: Earn Frequent Player Points (FPPs) up to 3.5 times faster, Participate in exclusive VIP Freerolls, At the higher levels of the VIP Club, you can use your FPPs to purchase consumer goods, including iPods, high-resolution computer monitors, travel packages, and more., At the highest level of the VIP Club, use your FPPs to buy directly into the PokerStars Caribbean Adventure, the European Poker Tour, and the main event at the World Series of Poker. Deposit: NETeller: Deposit in US$, CAN$, EURO or GBP, no charge for InstaCash, Minimum deposit only $25, eChecks (available to US and Canadian players only), CentralCoin, VISA, MasterCard, Gift and Prepaid MasterCard, Diners Club International, Solo / Maestro / Switch (available to UK players only), Cashier's Check / Money Order / Bank Draft - Minimum deposit only $100, Local Bank Wire Transfer (available to Austrian, Belgian, Finnish, French, German, Greek, Irish, Italian, Dutch, Portuguese and Spanish players only). There are not any user reviews posted for this site yet. Be the first to review it.